Members of Limerick Fire & Rescue Service with members of Abbeyfeale Fire Brigade. Front: Paul Doody Abbeyfeale, Richard O Mahony Abbeyfeale, Gerry Lyons Abbeyfeale Station Officer, Michael Ryan Limerick Chief Fire Officer, Paul McMahon Limerick Assistant Chief Officer,Timmy O Sullivan Abbeyfeale, Kevin Murphy Abbeyfeale. 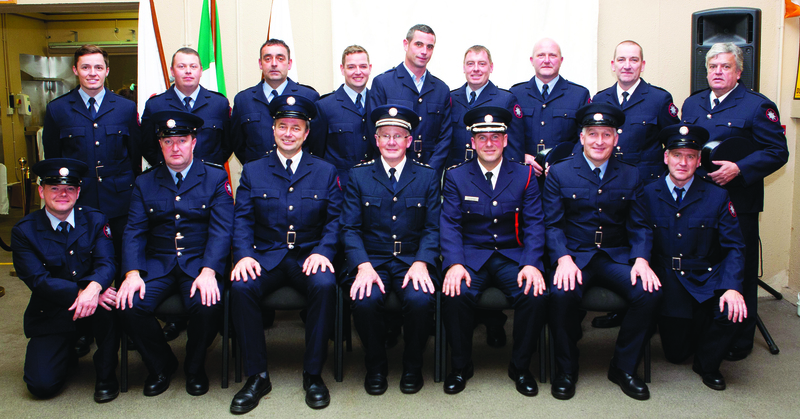 Back: Sean Browne Newcastle West Fire Service, Willie O Connor Foynes Fire Service, Pakie Moroney Foynes Fire Service, Chris Doody Abbeyfeale, Kevin Lyons NCW Fire Service, Declan O Connor Abbeyfeale, Gerard McCarthy Abbeyfeale, John Lyons Station Officer Rathkeale, Greg Conway Station Officer Kilmallock. Friday night 31st August Abbeyfeale Fire Brigade marked the 50th anniversary of the founding of the brigade in the town. The celebrations began with Mass in the local Church of the Assumption celebrated by Canon Tony Mullins P.P.at 7pm and afterwards moved to the Fire Station. Present were Minister Patrick O’Donovan, Mr Niall Collins T.D., Mr. Michael Collins Deputy Limerick City and County Council, Mr. Frances Foley, Mr. Liam Galvin and Mr. John Sheahan all members of Limerick City and County Council, Mr. Michael Ryan Chief Fire Officer Limerick City and County Council, Mr. Maurice O’Connell Chairman of the Abbeyfeale Community Council as well as representatives of the County Fire Service and personnel from the Listowel and Castleisland Fire Brigades. 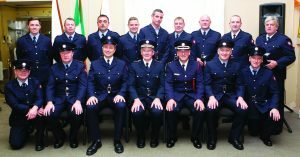 Present also were members of Abbeyfeale fire service, past and present, as well as members of an Garda Siochana and a large number of invited guests. Mr. Jerry Lyons Station Officer opened the proceedings and welcomed everybody before introducing Mr. Michael Collins Deputy Mayor. The Deputy Mayor spoke of the importance of the service and the dedication of the members of the retained brigade. He then unveiled a wall mounted Roll of Honour on which is printed the names of all the fire fighters past and present who served in the station since its inauguration 50 years ago. Mr. Frank Dennison, retired Assistant Chief Fire Officer then gave a history of the brigade from its beginning. He outlined the various stages of development over the last five decades and highlighted the many improvements. He also spoke of some memorable incidents during that period. Mr. Michael Ryan, Chief Fire Officer, Limerick, then spoke in Irish and English and reiterated the commitment and dedication of the fire brigade personnel. He made special mention of the sacrifices of their families and how they had to understand that special occasions may have to be postponed as the emergency was the first priority. He emphasised the need for all personnel to be fully trained to deal with the wide range of emergencies that they may encounter, and confirmed the commitment of the local authority in supporting the continuous development of the Service. The formal proceedings concluded with Mr. Maurice O’Connell, Chairman of Abbeyfeale Community Council presenting Station Officer Jerry Lyons with a plaque of sppreciation to the brigade for its 50th year of dedicated service. Catering for the occasion was provided by Leen’s Hotel.